This small business sustainability summit will provide area business owners with actionable information and business practices that can be implemented to help them begin or grow their business sustainability initiative. Alameda Connects is committed to creating a safe, healthy, and sustainable environment along the Alameda corridor. We demonstrate this commitment by sponsoring sustainable efforts, helping others make sustainable choices, and leading by example. 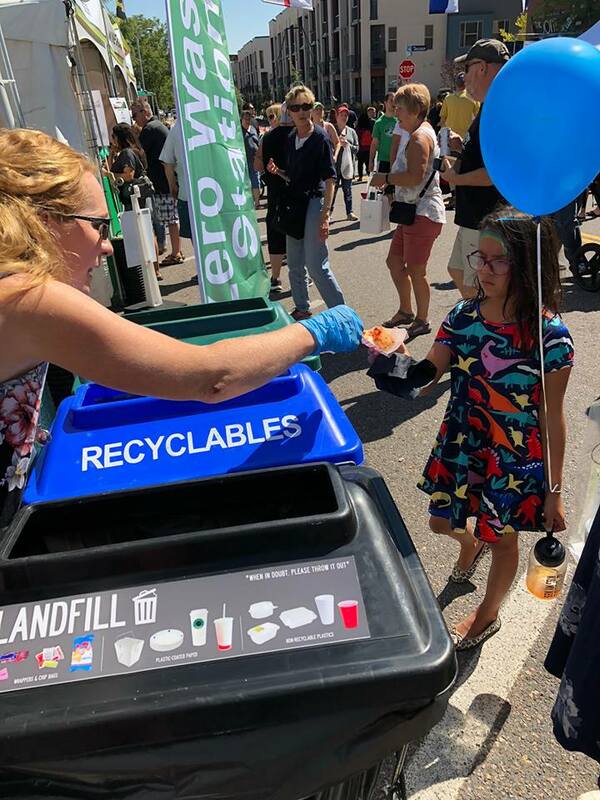 Alameda Connects was a proud sponsor of the zero waste stations at Festival Italiano at Belmar. With the help of Zero Waste Services, the goal with this endeavor is to help make this two-day festival a zero waste event over the course of five years. Through a partnership with the Clements Center Sewing Group, Alameda Connects collects old and unwanted t-shirts so they can be converted into shopping bags. These shopping bags are then distributed at the Lakewood Farmers’ Market to avoid the use of single-use bags. at The Clements Center located at 1580 Yarrow St. Mon – Fri, 8 a.m. – 5 p.m.
Alameda Connects believes it should lead by example and demonstrate to the community the benefits of a zero waste corridor. We accomplish this by hosting zero waste events that offer recycling and composting options. We also encourage our meeting attendees to bring their own reusable coffee mugs to avoid the use of single-use cups.